Viewers who miss the credits of Hotel Transylvania, an animated romp with Adam Sandler as a single-dad Dracula fretting over his hundred-and-teenage daughter (Selena Gomez), might not suspect Genndy Tartakovsky is behind it. The Cartoon Network auteur who created Samurai Jack and Dexter’s Laboratory has previously favored hand-drawn animation, but Hotel Transylvania is rendered with the computerized 3-D that’s become all but mandatory for studio projects. But however different the film’s look, and even though Tartakovsky came onto the film late, after several other directors tried and failed, the film bears ample evidence of his crackerjack comic timing and expressly cartoony style. 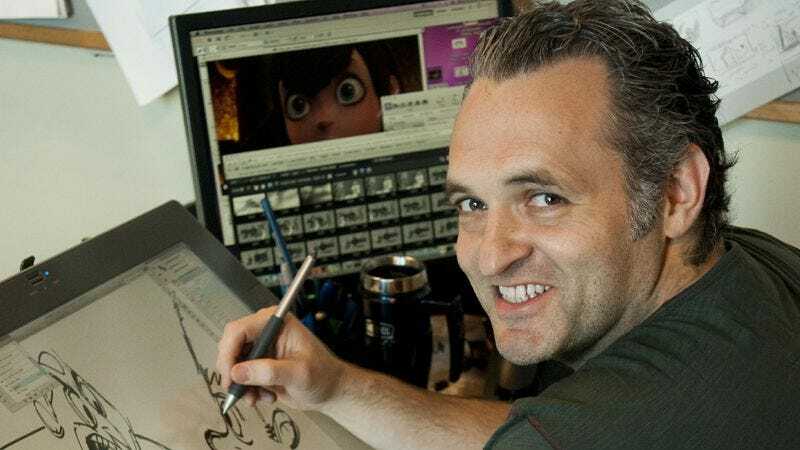 Perhaps more importantly for longtime fans, the project also served as a toehold for Tartakovsky at Sony Pictures Animation, where he’s now at work on a 3-D Popeye movie and talking over possibilities for a long-awaited Samurai Jack movie. On the phone from Sony’s headquarters, Tartakovsky talked to The A.V. Club about making the leap from TV to film and from hand-drawn to CG, the crushing cancellation of his series Sym-Bionic Titan, and the “infantile” state of modern-day animation. The A.V. Club: You came onto Hotel Transylvania as the sixth director on a troubled, long-gestating project. What did you start with? Was your first job to clear the slate, or did you have to assimilate a mass of unworkable false starts first? Genndy Tartakovsky: You start with a stew of everything, and nothing really works. You’ve got a castle that’s already built, and you have some stuff you don’t need, and other stuff that’s missing, and you have characters that are from different stories, and you have this new script that you’re working on, and you have to get all these stories to work into one cohesive idea. To be honest, when you have a project that’s been around for almost six years, there’s a lot of turmoil between departments, and everyone is just a little burnt-out and bitter. So being the new guy coming in, especially from TV, it’s like, “What are you going to be able to do?” You really have to prove yourself. Thank God I had the experience that I did, and I had the confidence to make decisions and stick by them. That was the biggest test. Everything gets really scrutinized, which it should—I mean, it’s a big-budget movie, and there’s nothing wrong with that. But you have to have some security in your own decisions. It was definitely challenging, but slowly I started to win the team over. AVC: Reading between the lines, it seems that after Cartoon Network declined to pick up Sym-Bionic Titan for a second season, you were ready to move on and do features instead of TV. Is that fair? GT: Yeah, I mean, I needed work. [Laughs.] I was heartbroken, for sure. I was so proud of what we had done on Sym-Bionic, and that had never happened to me before. So I just needed something new and fresher, and even though I still had a good relationship with Cartoon Network, it definitely felt like it wasn’t the right place for me anymore. I was already working with Sony on a different project, and I met with them and told them I was prepared for more stuff, and they were like, “Oh. Well, actually, we have this opportunity.” I blame so many things on fate, and I felt like fate intervened, in a way. AVC: It’s fortuitous in the sense that Hotel Transylvania was already in the works, however imperfectly, so you didn’t have to spend any time getting it off the ground. It’s a mixed blessing. GT: It used a lot of different muscles than I’m used to flexing. The closest thing I’ve done to something like this is Star Wars [the Clone Wars animated series], where I already had characters and stuff, and I just had to try to execute them. This was very similar. And like you said, it was a mixed blessing. I had to make the puzzle pieces work, but I didn’t have to come up with them from scratch. It was kind of like a live-action set: Here’s your location, here are your stars, now make it work. AVC: How was the adjustment to CG for you? You were working with a much larger crew than you’re used to as well. GT: In a way, the CG was easier for me, because I don’t know how to animate with a computer. I’m very limited with my computer knowledge, but in drawings, I can do every step of the job. I can do camera work, I can do cleanup, I can do design—not great, but I know how to do it. Here, I was in a situation where I didn’t know how to do anything. So when I had a problem, I didn’t have to give them solutions. [Laughs.] I had a great visual-effects supervisor, Daniel Kramer, and I would go, “This isn’t working for me. I’m not going to tell you how to fix it, but these are the problems.” And then it would be his job to fix it. That made my job a lot easier, because I didn’t have to problem-solve. Well, I did have to problem-solve creatively once in a while. But generally it was his headache how to make it work. Like, Dracula’s cape was really complicated—I wanted it to be only a silhouette sometimes, and other times, I wanted it to be normal. I had no solutions for them, but I think they liked that. It empowered them and made them feel like they were really doing something, and I didn’t have to spell everything out. I had a great team. So the CG was great. It was a lot easier than I thought it was going to be. I was prepared for this huge fight, and in actuality, they never said no, and I got pretty much everything I wanted. AVC: Do you think it helped that you came from a different world? If you’d come up doing CG, you’d have an ingrained sense of what is and isn’t possible. GT: Yeah, I think so. I’ve heard horror stories from my friends who work in the industry. But I just said, “This is what I want,” and I got it as close as I possibly could with the tools and people that we had. AVC: CG is just a tool, like a brush or a hammer, but the default is to push it toward realism even when it isn’t appropriate. There’s no reason we need to see Shrek’s pores, except it gives the animators a chance to show off. It doesn’t really fit the story. GT: Exactly. Like you said, the computer is designed to mimic reality. And in an animated world, in my perspective, that’s the worst thing to do. I want people to walk into a movie theater and be transported to a different world. One thing I kind of gave up on was doing any special treatment on water. The water was going to be real, and they had all these neat tools to do that, so we didn’t really have time to really redesign water for this movie. That’s one thing I’ve always complained about—water always looks real, whether it’s in Pirates Of The Caribbean or Smurfs. [Laughs.] Water always looks like water. AVC: Even different animation studios use some of the same programs, which lends a sameness to the final product. GT: The design styles between each studio are getting closer and closer. Some of the guys who design for DreamWorks also design for Pixar and for us. It’s almost like everything is starting to look the same. AVC: The 2-D animation you’ve done, especially in Samurai Jack, is often deliberately flat, almost flamboyantly graphic. So how was working in 3-D? You haven’t shown much interest in that kind of naturalism before. GT: The 3-D is such a complicated thing, because you’re not just making a 3-D movie. You’re also making a 2-D movie. It’s kind of like in TV when they let us do widescreen. We’re like, “Great! We can do 1.85 now!” But it has to be 4:3-safe. It doesn’t matter, because you’re not utilizing your extra screen space. It’s the same thing in 3-D. If I was going to do a purely 3-D movie, with no 2-D release, I would have shot it completely differently. But you’re making two pictures at the same time. There are some things in the 3-D version that aren’t in the 2-D version, because they just didn’t work. Some of the foreground elements stick out, you’re looking there when you’re not supposed to. Some things in 3-D really did look better. Like the Invisible Man’s glasses—because they’re just floating around, I thought they read a lot clearer and funnier in the 3-D, because they actually fill the space real nice. It’s complex. I didn’t think about it too much. I don’t normally even go to see 3-D movies, because for me, it’s hard to sit with the glasses, but I did try to embrace it and do things I thought looked tasteful and still fun. The flying-table scene looked really good. But it’s definitely complicated. Whenever you’re doing two things at once, you’re compromising them both. AVC: There are some nice character moments in the movie. But nothing’s as thrilling as that opening scene, where the hotel’s lobby is flooded with monster after monster after monster. It’s so frenetic, almost chaotic, and a great showcase for slapstick humor. You’ve said the opportunity to make a broad comedy is what drew you in. GT: Yes. And it’s funny, that sequence was originally like twice as long, but we had to cut it down more and more. That whole opening sequence, for me, was just about vaudeville and juggling plates. The music choice we did there was like circus music. And since we started kind of quiet and we were going to another quiet scene after, it was nice. But that sequence either hits people really positively or really negatively. AVC: When you first came onto the movie, what wasn’t working? What did you put your finger on? AVC: So the problem was with their visual design? Or does that bleed into character as well? GT: Yeah, it was character also. Especially Jonathan, because he’s got the romantic story with Mavis, and I’ve always wanted for a girl character to fall in love with someone who wasn’t obviously handsome. It was amazing, because for a little while, the studio was like, “We don’t see her falling in love with someone who looks like that.” And I was like, “Well, you love his personality, right? And we fall in love with personalities.” Looks obviously have something to do with it, but overall, it’s personality that we fall in love with. So why shouldn’t this animated film reflect that? That’s what makes it so much fun. AVC: With Jonathan, what’s appealing to Mavis is precisely how ordinary he is. Everything that is mundane to him is strange and exotic to her. It makes sense that the opposite of these monsters, who have historically been played in live action by incredibly charismatic actors, is a dorky backpacker. GT: When I first started writing lines for him, I made him sort of crazy and quirky and funny, and you really started to see his personality. Again, it’s so nothing out-of the-ordinary, but in terms of animated features, it was a lot crazier to do something like that. AVC: You haven’t exactly specialized in happy endings. Was it hard for you to work toward the big musical finish? GT: The thing is, I knew we were making this big movie. This wasn’t a movie where I had to push the storytelling. It’s a hotel for monsters. The title itself tells you what it should be. It’s goofy. It’s Hotel Transylvania. It doesn’t need to take itself so seriously. Like with the wife’s death, we really played with that tonally. It felt like it was in the wrong movie sometimes, so we had to deliver it very carefully. Half the challenge of making a movie is knowing what movie you’re making. Once we all agreed that we were making a broad, silly, funny comedy with heart, that was the movie we were making. AVC: In terms of making the transition from TV to film, where does your animated prologue for Priest fit? That was a brilliant sequence, and it’s much more in line with what your animation has looked like previously. What was that experience like? GT: It was great, because the director of the movie, Scott Stewart, he was a partner with me in our animation studio, before we kind of fell apart, so he had the ultimate trust in me, and he knew I could deliver. So creatively, it was great. The movie was based on this comic book, so I took the style from the comic book. I made it my own a little bit, but that part was easy. We had a limited budget, and for me, always, the budget drives what you’re going to do, in a way. If I have millions of dollars, I could do something that’s super-fully animated. And I wanted it to feel like it wasn’t fully anime; I still wanted it to feel like it was done the American way. So I ended up doing a lot of the animation, and it was fun to do that type of animation, because you never get a chance to do something so adult. Even though it’s just violent, still it takes itself seriously and it’s very stylistic. It’s funny, through my career, I’ve done stuff as silly as Dexter’s Laboratory, which is very comical, and then I got more and more serious with Samurai Jack and Clone Wars and Titan, even though Titan still had a lot of comedy. I feel like for me, the ideal is this mix between humor and action. Animation is so infinite… [Laughs.] Not infinite, infantile, in the type of stories we tell. We’re still telling these big four-quadrant movies. Why can’t we do a really cool action movie? Or a really cool little drama? That’s where I hope we can push it someday. AVC: Speaking of the mixture of humor and action, you’re now working on a Popeye movie. What’s your take on the character? Are you going for something more akin to the Fleischer cartoons, or the original E.C. Segar strip, or your own interpretation? GT: Yeah, it’s going to be animated as well. I feel like I have a very contemporary story that’s relevant to myself as a parent and to others. It’s more of a parents’ story than a kids’ story, but it is a family comedy/adventure type of thing. AVC: In tone, how broad is the comedy? Or is it more dialogue-driven? GT: It’s actually super-visual. It’s a little bit of both. Because I’m writing it from scratch, it definitely has more of my sensibility. The visual stuff is more balanced with the dialogue. AVC: Unlike Popeye, it’s something you literally and figuratively own, since you’re doing it from scratch. GT: You get to control everything. And since for me, everything is the pacing, the timing; the more I can control that, the stronger the point of view is. AVC: As far back as your New Yorker profile in 2002, you were talking about doing a Samurai Jack movie in live action, and it seems to have been close to a green light several times since. Where is it now? GT: I feel like I have to make it just so I don’t get any more questions about it. [Laughs.] I feel Jack’s been propelled into features, whether live-action or animated, like four different times now, with different producers. Every time, they come to me and say, “We love Samurai Jack because of A, B, and C.” And then we do the deal and we start working on it, and they go, “Well, now that we’re making a movie, we can’t do A, B, and C.” And I go, “That’s the whole reason this whole thing works.” I’m very frank with them, but I just can’t convince them, because I’m from TV and don’t know anything. I don’t think Jack is that radical, but there are certain elements that make it what it is, and I fight for those. So we do it, I write it, or someone else writes it, and then it doesn’t go anywhere, because it’s lacking that magic that makes it work. So that’s happened four times now. I’ve have a great story. I’m so excited about it. I have a great ending that’s perfect for me and for everyone who likes it. It’s totally in tone with everything. Now, after doing this, the studio really likes what I do, and the great thing is doing all this press, and they’re around for some of the conventions, and of course Samurai Jack is a big part of that. People are demanding the movie, and they’ve caught notice of that. So all of a sudden, my boss goes, “Well, maybe we can do Jack here.” So we’ll see. If this movie makes money, that might open the door for Jack to be more much more easily done.